VISALIA – Generosity and grandeur are combined as the Visalia Chamber of Commerce presents “The Giving Tree” – the 33rd Annual Christmas Tree Auction– set to kick off Friday, Dec. 6, at the Visalia Convention Center. Hosted by the Visalia Chamber, the Christmas Tree Auction has become a local holiday tradition. Each year more than 900 people dress up in their finest clothes and kick off the holiday season in a giving spirit. The Christmas Tree Auction is the only public formal event in the city. From a sit down dinner, to dancing, entertainment and wine tasting, this is an event not to be missed. The focus of this event is to raise awareness and donations for the amazing local non-profit organizations in the city of Visalia. More than $4 million has been raised for local charities in the last 32 years. Last year’s event brought in nearly $300,000 in donations, underscoring the significance of this annual event, and its impact on the budgets of local non-profit organizations. This year, attendees have the choice to attend the Christmas Tree Auction on a General Admission ticket or as a VIP Guest. General admission includes: wine tasting, hors d’oeuvres, silent auction, dessert & dancing. The VIP ticket includes: a sit down dinner, Live Christmas Tree Auction, wine tasting, hors d’oeuvres, silent auction, dessert & dancing. General admission tickets are $60 (7:30 – 11:30 p.m.) while VIP tickets are $125 (5:30 – 11:30 p.m.). This year the Visalia Chamber has announced a new Community Giving Tree, sponsored by Groppetti Automotive. During the evening attendees will have the chance to purchase tickets to win the Giving Tree. At the end of the evening one ticket will be chosen and the winning individual will have the opportunity to donate all of the proceeds from the Giving Tree to a local charity of their choosing. Special sponsorship opportunities are still available for interested businesses, and tickets are still being sold. 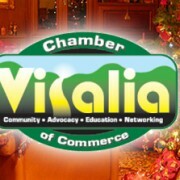 Contact the Visalia Chamber at (559) 734-5876 or visit the Chamber at 220 N. Santa Fe St. in Visalia, or online at http://www.visaliachamber.org/.